Every remodeling project generates dust, often in quantities that can quickly transform a home from an oasis to the Sahara. 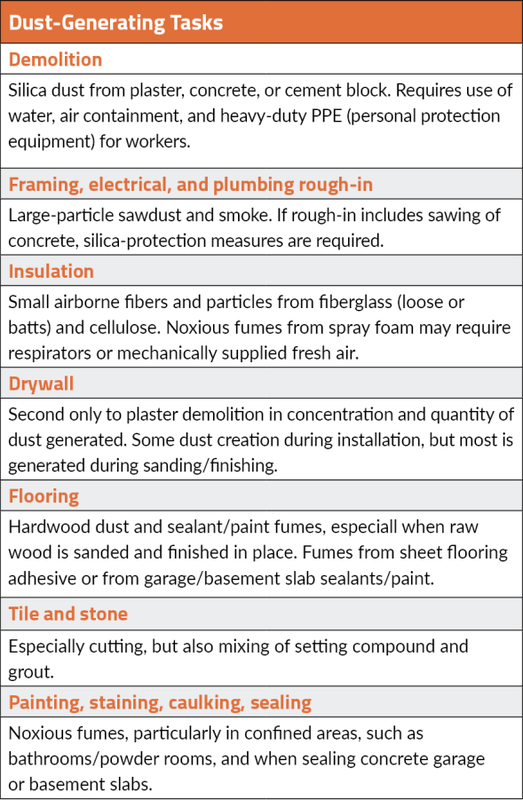 Even if that dust were completely benign to human health, it’s a messy nuisance that is a chief worry for first-time remodeling homeowners and ranks among the top complaints of homeowners who have lived through a remodeling project. But the fact is, dust generated during remodeling contains a litany of bad actors that includes lead, silica, mold spores, volatile organic compounds, rodent feces, insect parts, and other particulates that can harm both workers and homeowners (see “The Dirt on Dust, Part 1”). When the Environmental Protection Agency’s Lead Repair, Renovation, and Painting rule went into effect in 2010, it raised awareness around the potential hazard remodeling dust presents. 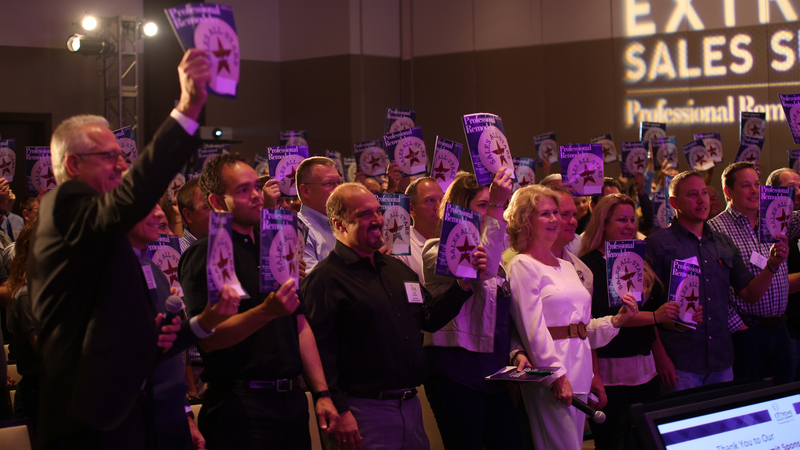 And while the rule added red tape and expense to remodeling projects, it motivated many contractors to add dust-control measures to their standard practice, whether or not lead is present. (To those who didn’t get the message, more red tape and expense is on the way in the form of OSHA’s revised silica rule—see Silica on the Jobsite). In this second in a series of articles on the dust problem in remodeling, we look at dust control measures and the products used to implement them with the goal of moving remodelers a step closer to creating a dust-free jobsite. Dust control measures allow homeowners to live in their house during a remodeling project without worrying about health issues or having to constantly clean up nuisance dust. They also protect workers from health hazards, some of which can accumulate over months or years of exposure. As a side benefit, they contribute to customer satisfaction by protecting the home’s systems, such as HVAC equipment and ducting, as well as electronics, furniture, and other homeowner possessions stored in the open, on shelves, or in cabinets. Dust is a by-product of a variety of tasks that occur at many points along a project’s timeline. Effective dust protection seeks first to reduce the amount of dust released into the air at the source, then to control the flow of air into and out of a confined work area. It also employs both mechanical air filtration and respirators for workers as needed. Here’s a step-by-step look at how remodelers implement this strategy, along with some of the products they use to ensure its success. When Greg Rehm of Liberty Hill Construction, in Bedford, N.H., asked customers about pain points during remodeling projects, dust was at the top of their list. As a result, dust control is the first order of business on all of his jobs. “We start with floor protection, then erect temporary walls around the work area using plastic sheeting, ZipWall components, and tape,” Rehm says (see Dust-Control Products and Equipment). Turn HVAC systems off. Containment also means keeping dust out of HVAC ducts and equipment. “If you do a great job on the remodel but a client’s air conditioning doesn’t work because of clogged coils, that doesn’t help your reputation,” says construction best-practices consultant Steve Easley, of Steve Easley & Associates, in Danville, Calif. If weather allows, turn off HVAC systems connected to the containment area and seal supply and return registers. Also seal or isolate any ductwork running through the containment area to prevent dust from entering through unsealed joints and spreading to other areas of the home where HVAC zones are still operational. “The best strategy is to first make sure all ductwork is sealed at the seams, using UL-approved mastic,” says Susan Raterman, a Certified Industrial Hygienist with The Raterman Group, in Danville, Calif. “It should be sealed anyway to operate properly.” If this is beyond the project scope of work, an alternative is to temporarily seal the ducts using poly and tape. If you need to leave the heat or AC on during construction, use filters at floor registers and air returns. Jay Cipriani, of Cipriani Remodeling Solutions, in Woodbury, N.J., uses Pro-Vent dust covers at registers. Rob Robillard of A Concord Carpenter, in Concord, Mass., also uses furnace filters or fiberglass filter material that comes in sheets or rolls that can be cut to size. Robillard’s blog notes that filters will trap debris and large particles, but ducts may need to be vacuumed to remove finer particles that may have passed through. Protect the homeowners’ property. Don’t forget the obvious: covering and sealing cabinets, countertops, shelving, and other areas where dust may collect. That includes any of your client’s furniture or personal property that’s in the line of fire and can’t be removed. Even though floors and walls can be cleaned afterward, they should be covered for as long as possible to protect them from damage from debris as well as from heavy foot traffic. Remove and store rugs away from the work area; carpet can be covered. But, as Dale Contant of Atlanta Design & Build, in Marietta, Ga., discovered on a recent project, it’s often easier to remove the carpet. “The client had recently installed new carpet that they wished to keep, so we rolled it up and protected it with film plastic,” Contant says. Outside of the containment area, protect carpet from foot traffic with one of several commercially available products. The next lines of defense are controlling air supply and exhaust and filtering air in the containment area. If your work will generate silica dust, you may need to follow procedures prescribed in OSHA’s final rule for Respirable Crystalline Silica, many of which, such as using water or vacuum systems to control dust at the source, also make sense for non-silica-generating tasks. 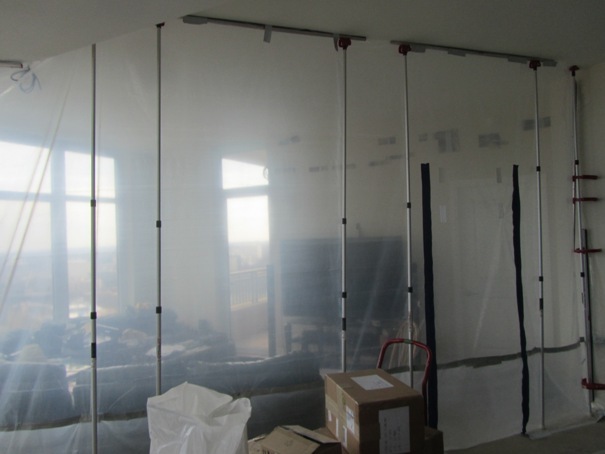 The most effective way to keep dust from escaping is to create negative air pressure in the containment area. An inexpensive solution is to seal a box fan into a window to pull air out of the space. This will draw makeup air into the containment area, either through small breaks in the seal or through the door when someone enters or leaves the area, and will prevent dusty air from leaking into the house. If you are worried about where the makeup air is coming from, seal the vent hose to the temporary dust walls and run it outdoors. To maintain negative pressure, make sure more air is leaving the containment area than is being drawn in. Maintaining negative air pressure may be a good solution during demolition, but it isn’t always practical to maintain for the duration of a job. A good alternative is a portable filtering system, such as the BuildClean Dust Control System (shown at left, photo courtesy Hamtil Construction), or Novair from Novatek. This equipment is more expensive, but it can be used either in negative air-pressure mode (when equipped with a vent hose) or to filter and recirculate air in the containment area. It can also be equipped with HEPA (high-efficiency particulate air) filters, which are required for work involving lead or silica. A filtering system also makes a strong positive impression on homeowners. 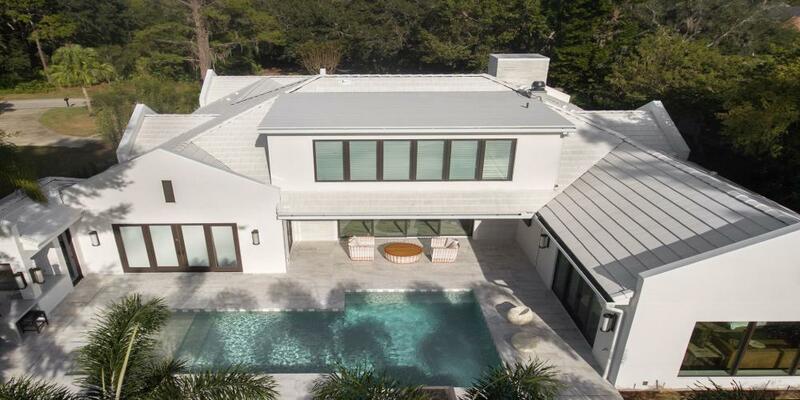 “By using an enclosed vacuum with a HEPA filter, the perception of the customer is that we are doing everything we can to keep their home livable and healthy,” Contant says. As we learned in “The Dirt on Dust,” the most dangerous particles in construction dust are too small to see (less than 40 microns wide). Those smaller than 1 micron—such as particles generated from smoke, asbestos, lead, clay, and silica—can penetrate into the deepest regions of the lung, where they can overwhelm the body’s natural defenses, creating inflammation and scar tissue that, over time, may reduce lung function and lead to cancer or other diseases. Many common tasks undertaken during a remodeling project expose workers to high levels of airborne particulates. When exposure is brief, an air-filtration system alone may be adequate, but even with air filtration, workers performing tasks like drywall sanding should wear an appropriate respirator. And OSHA may require it for tasks such as plaster or concrete demolition and concrete cutting. Respirators. 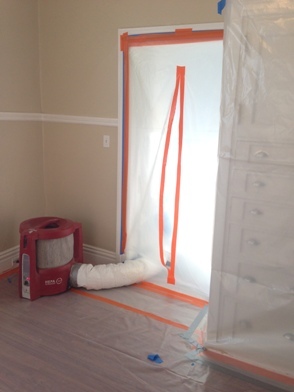 Air-purifying respirators are the type most likely to be needed on a remodeling site. These use filters and interchangeable cartridges to remove contaminants from the air. Those classed as “loose-fitting,” such as the woven dust masks sold in hardware stores, are not as effective because air can leak in at the perimeter. “Tight-fitting” respirators rely on a seal to the face to work properly, and where they are required to be worn, workers must be individually fit-tested before first use, and again every 12 months (opposite page, bottom). 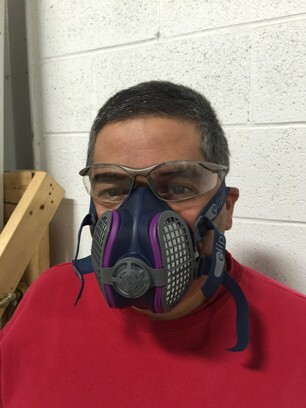 For most remodeling work, a half-facepiece respirator covering the nose and mouth is adequate (photo courtesy Case Design). Respirators should be worn not only by workers performing the dust-generating work, but also by anyone working in the same area who is exposed to dust-laden air. Tasks that involve airborne gases, such as working with solvents or spray foam, may require a full-facepiece respirator, which covers the nose, mouth, and eyes. Half-facepiece respirators are classified using a letter-number combination to indicate resistance to oils and filtering efficiency. For example, the “N” in an N95 respirator indicates that it is not resistant to oils; “95” indicates that the filter removes 95 percent of airborne particles (in the absence of oils, which degrade efficiency). P100 HEPA-filtered respirators are oil-proof and filter 99.97 percent of airborne particles. There aren’t any excuses for not controlling jobsite dust. Even if there was no silica rule and OSHA didn’t require a written safety plan that includes an indoor air-quality component, remodeling clients want a livable, dust-free environment during their project. And you don’t need a manual to predict when a job’s going to be dusty. Amanda Voss is an author and policy analyst based in Denver. She is managing editor for Energy Design Update. Ready For Your Deck Inspection?